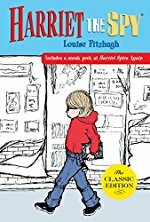 Harriet the Spy is a 1964 children's novel written and illustrated by Louise Fitzhugh. Eleven-year-old Harriet M. Welsch is an aspiring writer who lives in New York City's Upper East Side. Harriet is precocious, and enthusiastic about her future career. Encouraged by her nanny, Catherine "Ole Golly," Harriet carefully observes others and writes her thoughts down in a notebook as practice for her future career, to which she dedicates her life. Possibly the greatest book of all time. I agree. I was obsessed with this as a child and is probably why I have been keeping a journal since then. Simply a brilliant book, I distinctly remember reading it and wanting to be a writer at that age. This might be my favorite book ever. I still cling to my harriet_thespy Hotmail address. I also recommend the two follow-ups, Sport and The Long Secret. I am off to read all these lovely links and then shall return to the thread. I also recommend the two follow-ups, Sport and The Long Secret. I read The Long Secret but I had never heard of Sport. I see now that was because it was not yet published when I was in my Harriet years. That'd do it. This post brought up memories as well now that i've thought about the book more. This is where I learned what a dumbwaiter was (and was so jealous and immediately wanted one) and also maybe the inspiration for the first story I ever wrote in grade one about a girl named pinky who lived in a pink house and drove a pink car and was a detective who investigated pink fluff she found (I just learned to spell the word pink I believe) and why I said so young that I wanted to be a writer. I wouldn't be surprised if its also behind my life long interest in the mystery genre. I went away from it with the idea that spying had CONSEQUENCES, but I remember appreciating even when I read it that the book accepted some moral ambiguity in everyone's actions. I could understand why Harriet spied and why people were upset about it when she was discovered. I had a short shelf of books and a lot of free time as a kid, so I reread this one dozens of times. I should go back to it and see how it holds up. Did anyone ever begin to understand what was up with the nickname "Ole Golly"?